Piping and instrumentation diagram is often a vital and basic part of a whole project which requires great tool for creating. Edraw helps engineers create intelligent process and instrumentation diagrams to save time and improve accuracy. 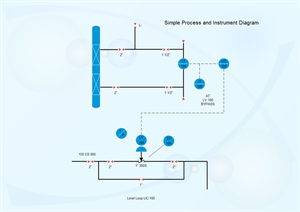 What's a piping and instrumentation diagram? Piping and Instrumentation Diagram (P&ID), which is also known as process and instrumentation diagram, is a schematic illustration in the process industry showing the piping of the process flow together with the installed equipment and instrumentation through graphical symbols. It shows how industrial process equipment is interconnected by a system of pipelines, which is required by engineers to start planning for the construction of a plant. Learn P&ID diagram knowledge. Why piping and instrumentation diagram is important? 1. It's used as a Process Plant Layout and Piping Design reference for checking engineering and design documents and drawings associated with a project. 2. It plays a very important role in plant maintenance and modification in that they demonstrate the physical sequence of equipment and system as well as how they all connect. 3. It's the last stage of process design and serves as a guide for those who will be responsible for the final design and construction. 4. It's also used to train operators and plant simulators. 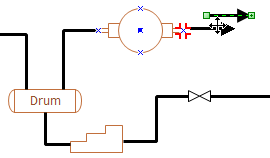 How to Create a Piping and Instrumentation Diagram? In Edraw, the Process and Instrumentation Template helps you easily create piping and instrumentation diagrams using massive built-in symbols. Double click the template from Engineering Category on the starting page to enter the drawing page. You will discover abundant symbols and easy-to-use tools available for piping and instrumentation diagrams. Edraw includes more than 500 vector P&ID symbols created from different international standards. In Edraw library, all P&ID symbols are classified into groups as equipment, valves, piping lines, instruments, etc., which you can easily use to depict mechanical equipment, piping, piping components, valves, equipment drivers and instrumentation and controls. 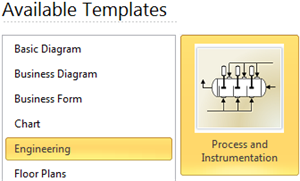 Go to Process and Instrumentation Symbols and Their Usage page to have a general knowledge about the symbols. 1. On the File menu, point to New, point to Engineering, and double click Process and Instrumentation template. A new drawing page will open. Print: When a piping instrumentation diagram is done, it's easy to print and share with more people. On the file menu, point to Print to set for print options. You can change settings with fewer clicks and see the print preview in real time. All Edraw documents are vector graphic files with high clarity. Smart tools are provided for automatic formatting. Easily arrange, rotate, group and align objects. Edraw offers various customization options, using which you can adjust line width, color, style, font size and style, text color, and much more. Here is a complete example of piping and instrumentation diagram created by Edraw.